Pathfinder savants roam Golarion in search of forgotten lore and ancient magical devices. They are specialists in the theory and practice of magic, illuminating mysteries of the eldritch fabric that permeates existence. The path of the savant brings mastery of the lore of glyphs and sigils, knowledge of exotic spells, and the power to unlock the full potential of magical devices. Feats: Magical Aptitude, any one item creation feat. Skills: Knowledge (arcana) 5 ranks, Spellcraft 5 ranks, Use Magic Device 5 ranks. Special: Ability to cast 2nd-level spells. 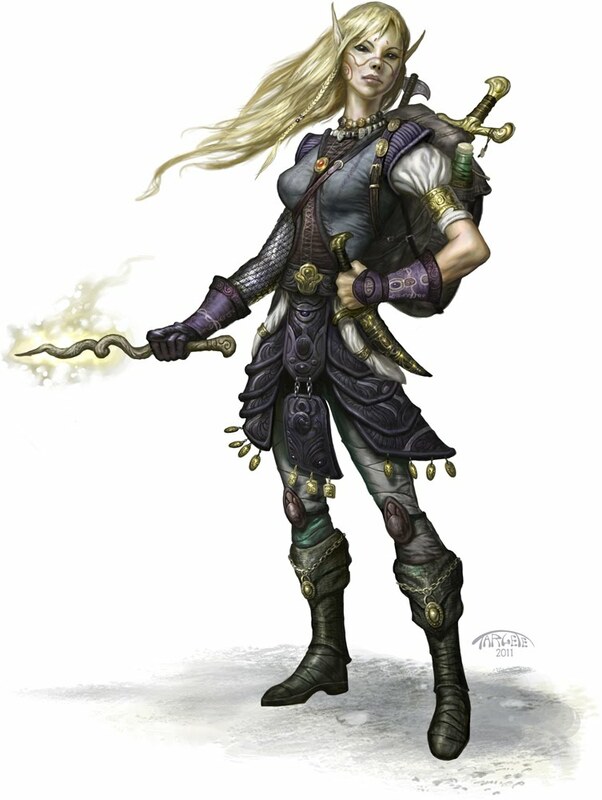 The Pathfinder savant's class skills (and the key ability for each) are Appraise (Int), Craft (Int), Knowledge (All) (Int), Linguistics (Int), Perception (Wis), Profession (Wis), Spellcraft (Int), Survival (Wis), Use Magic Device (Cha). All of the following are class features of the Pathfinder savant prestige class. At 2nd level and beyond, a Pathfinder savant gains new spells per day as if he had also gained a level in a spellcasting class he belonged to before adding the prestige class. He does not gain other benefits a character of that class would have gained, except for additional spells per day, spells known (if he is a spontaneous spellcaster), and an increased effective level of spellcasting. If a character had more than one spellcasting class before becoming a Pathfinder savant, he must decide to which class he adds the new level for purposes of determining spells per day. A Pathfinder savant can always take 10 on Use Magic Device checks, except when activating an item blindly. A Pathfinder savant adds 1/2 his class level (minimum 1) as a bonus on all Knowledge (arcana), Spellcraft, and Use Magic Device checks. He can always take 10 on Knowledge (arcana) and Spellcraft checks, even if distracted or endangered. At each class level beyond 1st, the Pathfinder savant chooses a spell from any class’s spell list and thereafter treats it as if it were on the spell list of his base spellcasting classes; if his base class could not normally cast that spell, it is treated as 1 level higher. The spell’s type (arcane or divine) and save DCs function as normal for his base spellcasting class. All other restrictions of his normal spellcasting class apply. This ability does not allow other spellcasters to prepare, cast, or use spell trigger or spell completion items of esoteric spells (such as a sorcerer using a cure light wounds scroll). At 2nd level, a Pathfinder savant can use Spellcraft to find writing-based magical traps (including glyphs, runes, sigils, and symbols) in the same way a rogue can use Perception to search for traps. A 3rd-level Pathfinder savant uses his own caster level instead of the item’s caster level when using a scroll or other spell completion item. Starting at 4th level, a savant may use identify as a swift action. He may do this once per day per two class levels. A 5th level, a Pathfinder savant receives a bonus equal to his class level on saving throws against writing-based magical traps, and if the save is successful he does not trigger the trap. If he leaves the trap’s area and then re-enters, he must save again. A trap that has already been triggered functions normally against a Pathfinder savant, though he still receives this saving throw bonus. Starting at 6th level, a savant may use analyze dweomer for up to 1 round per level per day. He may use this ability in 1-round increments. A 6th-level savant is able to activate spell trigger, spell completion, and command word items silently, substituting a magical gesture for the necessary words. He cannot use this ability in circumstances where he could not cast a spell with somatic components. He must know how to activate the item normally for this ability to work. Three times per day he may cast a spell of 6th level or lower as if he were using a silent metamagic rod. Starting at 7th level, if the savant prepares and casts spells like a wizard, he can spontaneously convert any prepared spell into dispel magic or greater dispel magic as a good cleric converts prepared spells into cure spells. If he casts spells as a sorcerer, he adds dispel magic and greater dispel magic to his spells known. Every time he successfully uses either of these spells to make a targeted dispel or counterspell, he heals hit points equal to the caster level of the effect dispelled or counterspelled.